Hello, everyone! Today’s article is a quick preview of Monsters of Feyland, an upcoming project from Cawood Publishing. 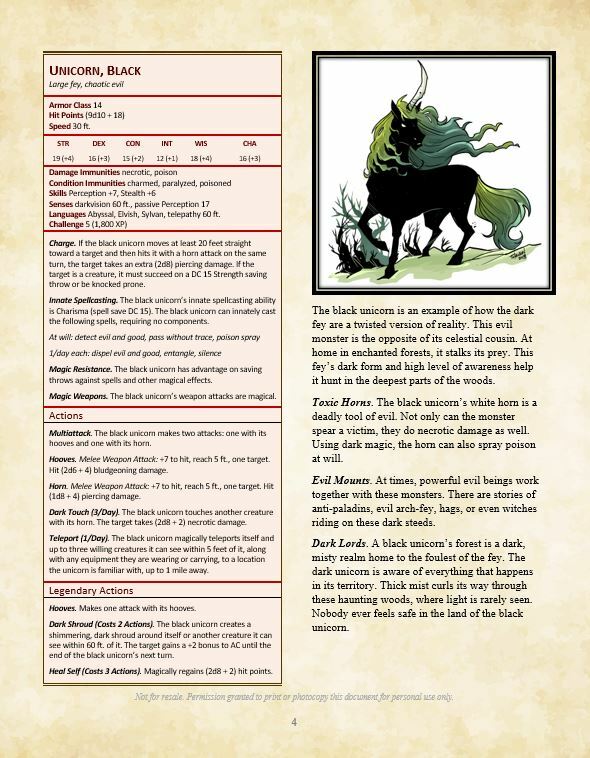 Monsters of Feyland is a bestiary of 100 new monsters, with the Fey naturally being the primary focus. 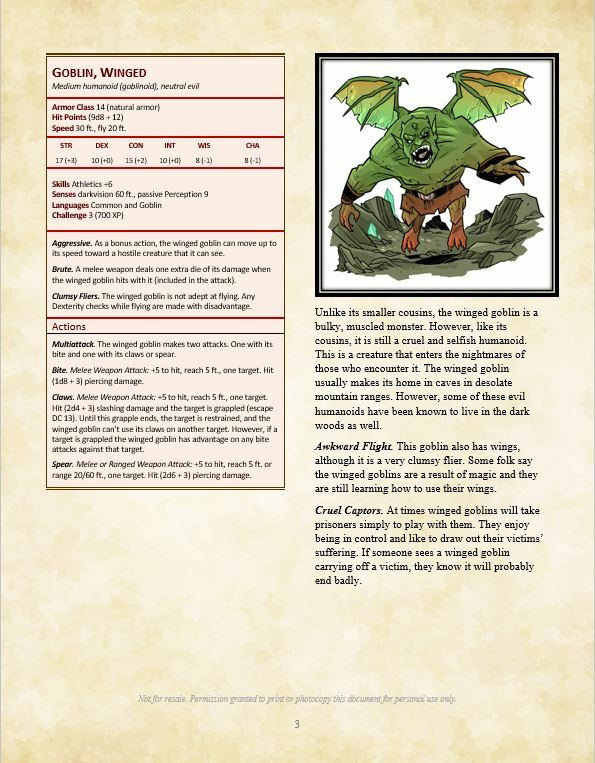 The book features new twists on existing monsters such as the Black Unicorn, Fey Ranger, and Winged Goblin, each in Travis Hanson’s charming style, a unique inked-and-colored style which sets it apart from the more common painting/digital painting styles which most Fifth Edition supplements use. 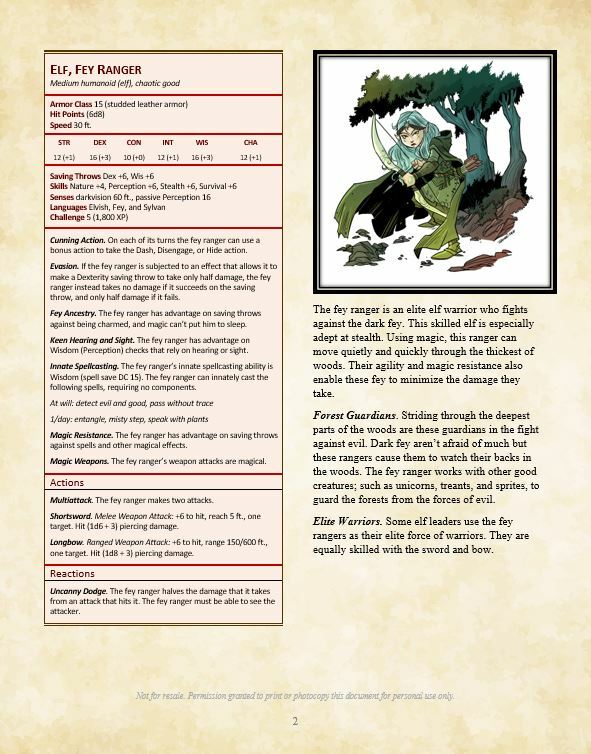 An important consideration when dealing with the Fey is that they are often not a straightforward combat encounter – Andrew Cawood explains that the inspiration to work with the Fey for the bestiary comes from the shift in focus from mechanics to narratives on a storyteller’s part. Famous examples of Fey stem from works such as A Midsummer Night’s Dream and Brothers Grimm fairy tales, which touch upon Fey creatures’ behavior as dangerous tricksters whose motivations are difficult to rationalize from the viewpoint of good and evil, or manipulative forces rather than coercive. At the time of writing, Monsters of Feyland is a little shy of halfway to its funding goal, with three weeks to go. A pledge of about $23 on Kickstarter will earn a PDF copy of the supplement as a reward, and $46 a hardcover copy, so it may be a little steeper of an investment than Tome of Beasts(which offers four times as many monsters for similar prices). However, if the book’s unique style has you suitably enchanted, you may want to visit the Kickstarter campaign’s page and back it. As always, be aware that Kickstarter is not a store, and you should exercise your best judgment when deciding whether or not to back a project. If you’re interested in how I decide whether or not to back a Kickstarter campaign, I wrote about that decision process here.